I had never really liked reading, and I thought it was a waste of time. But when my teacher told me to go to the library and find a book, I looked for one that I was actually interested in. 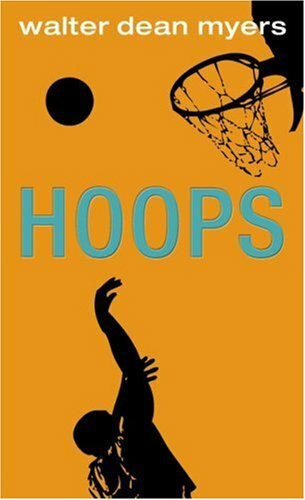 I love basketball, so I picked out a basketball book, and it was called “Hoops” by Walter Dean Myers. It is an incredible story, and I highly recommend it to anyone who loves basketball, and overcoming obstacles. Lonnie lives in Harlem, NY, and is struggling through poverty, and other struggles. He doubts his new couch, Cal, and doesn't think that he'll be there for his new team. He soon realizes what the man has done in his past, and can completely connect with him. Cal soon becomes a huge impact on Lonnie, and they face many challenges. It is an amazing novel, and I really suggest everyone to read it. This book makes me think about how hard it would be to grow up in a rough city. I have realized that basketball is a great way to escape the struggles us humans face. I have learned a lot from this book, and I think that anyone who reads it will too. I am now reading more Walter Dean Myers books, and he has became my favorite author. A lot of his books are about growing up in Harlem, just like he once did. From this story, you will learn that the people around you really affect who you are, and how much it helps to have the support of family and friends in your life. I hope you enjoy this book as much as I did. You have no life....to me it seems that this is a good book you might have a better life if you sit down and read the book.....!!!! "Some people think writing is a waist of their time. For me it’s a way to draw an image of myself through the painting of words." This book sounds very interesting im going to get this book. I also love basketball. Just wanted to say that, now I'll go read the review. This book sounds very interesting. I never read it but I need to. Kind of a school summer reading book but, I never read it...Everyone I knew told me it was interesting but, I had to see for myself. great book i want to read it the summary sound very interesting . I really want to read this book!LOL! man this book assume it kind of relates to my life.